Well, here's who did. Me. Andrew Smith. And Kimberly Pauley. Here's how I understand the bet, and I'm putting this out as something like a memorandum of understanding among the four of us. We have each picked a horse in the Kentucky Derby. Maybe none of our horses will win, but they have to finish in some kind of order. The one with the best showing of the four gets to dictate a story title to the person whose horse had the second best showing of the four. That person not only writes a story, but dictates a title to the person whose horse had the third best showing of the four. And that person not only writes a story, but gives a title to the person whose horse had the worst day. Seems to me the two fun spots are in the middle, because writing the story will be fun, and so will inflicting--I mean gracing--a fellow author with a story title of our choice. The three authors who write stories will post them on their blogs for all to see. If so, here is the field as it relates to the bet. Andrew Smith, who apparently is amused by the caption "Andrew Smith has Pants on Fire" has an entertaining post about the bet on his Ghost Medicine blog. It even links to stats about the ponies, if you're interested. 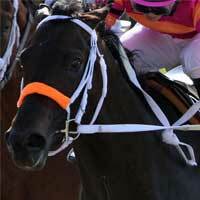 If I had known Pants on Fire was sired by Jump Start, I would have wanted him for my horse. But then the pants on fire joke would be on me. So maybe this is okay. Brian Farrey blogs today, in his own inimitable style, about The Bet. He also posted this link to Twitter this morning, basically stating that his horse (Dialed in) is the odds-on favorite, mine (Archarcharch) has drawn post position #1, which tends to be a disaster, and Kimberly Pauley's horse (Uncle Mo) has intestinal problems and might run with that handicap or might be scratched. Stay tuned for her to possibly pick a new horse. That old saw about changing horses in mid-stream does not apply to horses with gastrointestinal infections. Just so you know. Aaaaand...not to be outdone, Kimberly Pauley has now posted The Bet, Part Deux on Kimberlypauley.com. She has anounced a plan to stand by the ailing Uncle Mo unless he is actually scratched from the race. 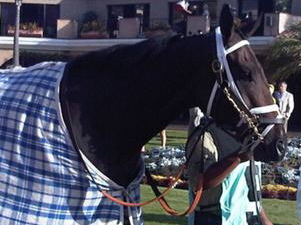 Kimberly Pauley's horse, Uncle Mo, was indeed scratched from the race. Kimberly's new horse is Comma to the Top.